Get ready to experience all the great moments of “Star Wars Rebels” season three like never before, as Lucasfilm has just announced that the complete third season will be releasing on Blu-ray and DVD on August 29th! BURBANK, California, June 28, 2017 –– Star Wars Rebels: Complete Season Three delivers all 22 action-packed episodes of the hit CG animated series’ third season, plus exclusive, never-before-seen bonus material on Blu-ray™ and DVD! The story threads begin to tighten in this thrilling season of Star Wars Rebels, drawing connections to The Clone Wars, Rogue One and the original Star Wars trilogy into the series’ epic storyline. 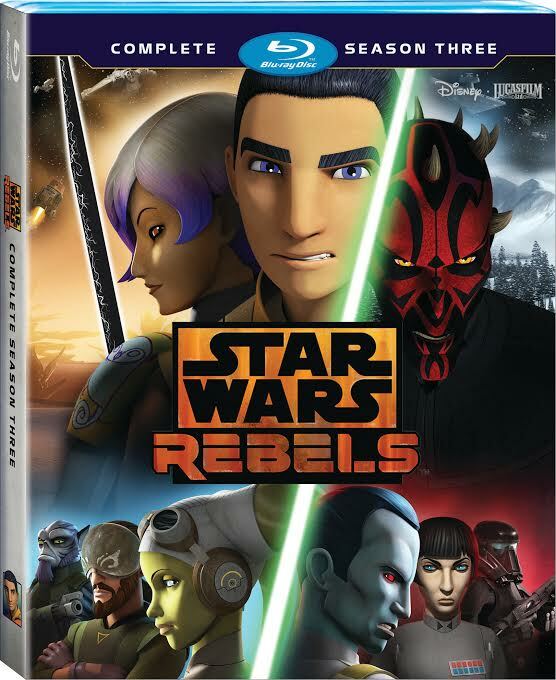 Available August 29, Star Wars Rebels: Complete Season Three delivers some of the most critically-acclaimed Star Wars storytelling to date, with engaging characters, harrowing conflicts, and spectacular space battles on par with those seen in the films. Return To Mandalore- Explore where Mandalore fits within the Empire’s regime–and whether Sabine can unite her people against the Imperial forces. Thrawn: A Legend Reborn- Learn Thrawn’s significance in Star Wars lore, and what the future may hold for this memorable villain. Apprentices to Outcasts: Kenobi And Maul- Track two adversaries who’ve clashed throughout Star Wars history, and find out why the time was right to conclude their story. discussing the character he brings to life in both Rebels and Rogue One. A Rebel Alliance- Discover how the formation of the Rebel Alliance in Rebels ties into the Rogue One timeline–and the exciting story possibilities that lie ahead for season 4. Rebels Recon- Go behind the scenes with the cast and crew in 19 entertaining and information-packed episode recaps! “Star Wars Rebels” always looks amazing on Blu-ray, so it will be great to experience this season again looking and sounding as good as it can be. But I am also really excited for the special features being included in this set, especially the five episode commentaries, which is something I’ve wanting to see on these releases for awhile.